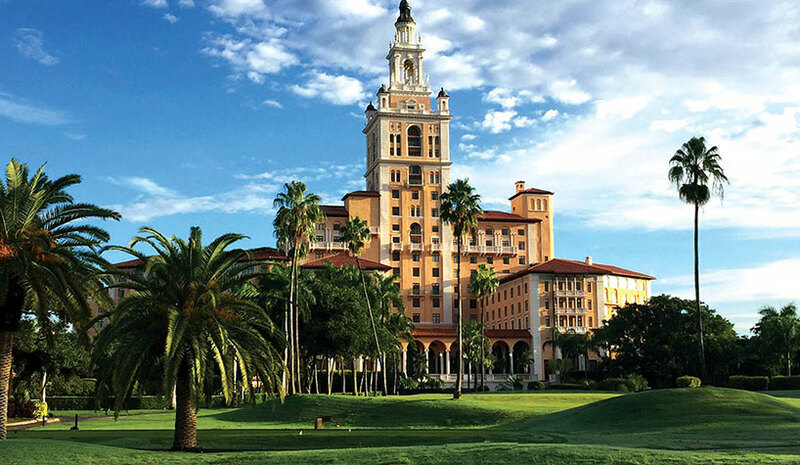 The Biltmore Hotel Miami is set to complete a $25-million renovation to its guestrooms and golf course. Both projects are scheduled to be completed in December and the hotel will remain open during renovations. The golf course restoration will be overseen by golf course architect Brian Silva and will restore the course to the original 1925 Donald Ross-designed course layout. Renovations will include new Bermuda grass on the existing tees, fairways and greens, new bunkers, enhancement of the short-game practice as well as separate range areas, challenging signature holes and the overall course length will be extended to more than 7,100 yards. D’Shakil Designs and Studio 5 Design + Architecture will complete the guestroom redesign. The hotel has already completed the renovation of its main lobby, a 10,000-sq.-ft. gym with new equipment and a new Babor retail space within its spa. JW Marriott Camelback Inn Resort & Spa in Scottsdale, AZ is completing its new 15,000-sq.-ft. Paradise Ballroom, including an additional 20,000 sq. ft. of outdoor and pre-function space, bringing the resort’s total meeting and event space to 95,000 sq. ft. In addition to the floor to ceiling windows which will provide views of Mummy Mountain, the new ballroom will be the first of its kind in the Marriott portfolio of resorts to house pieces of artwork from Marriott International’s Executive Chairman and Chairman of the Board J. Willard “Bill” Marriott Jr.’s personal collection. Charlestowne Hotels adds Atlanta’s Hotel Clermont to the company’s portfolio. Charlestowne Hotels worked in partnership with Oliver Hospitality to oversee renovations and will now take over hotel management. The 94-room boutique hotel includes four food and beverage outlets, including a French-American brasserie and a rooftop bar. Hotel Clermont maintains architectural details of the original building, including the Clermont signage and 65-ft. radio tower from 1940. Charlestowne worked closely with local partners, including the Georgia Historic Preservation Division and National Parks Service to develop a refreshed identity for the Clermont. Hotel Clermont offers 15 bunk rooms with en-suite bathrooms and twin bunk beds to sleep up to four people per room. The hotel will also have three luxury suites and 76 guestrooms with king or queen beds. The 118-room Hampton Inn Jacksonville Downtown I-95 Central in Jacksonville, FL has completed a renovation of its exterior building structure, guestrooms and public spaces. The $1.5-million renovation includes exterior structural improvement to building, LED lighting around the roof, new LED exterior signage and a newly designed porte-cochere. Updates to the interior includes wall vinyl throughout the hotel, new contemporary furniture in common areas as well as guestrooms, new light fixtures in bathrooms, enlarged fitness center and new pool furniture.